Base white balance on a direct measurement of the actual lighting conditions. Match white balance to an existing photo. To use this technique, you need a piece of card stock that’s either neutral gray or absolute white (not eggshell white, sand white, or any other close-but-not-perfect white). You can buy reference cards made just for this purpose in many camera stores for less than $20. Set the camera to the P, S, A, or M exposure mode. If the exposure meter reports that your image will be under- or overexposed at the current exposure settings, make the necessary adjustments now. Otherwise, the camera can’t create your custom white balance preset. Frame your shot so that the reference card completely fills the viewfinder. From the Shooting menu, select White Balance, press OK, and select the PRE Preset Manual White Balance setting. Press the Multi Selector right, select Measure and press OK.
A warning appears, asking you whether you want to overwrite existing data. You see another message, this time telling you to take your picture. You have about six seconds to do so. 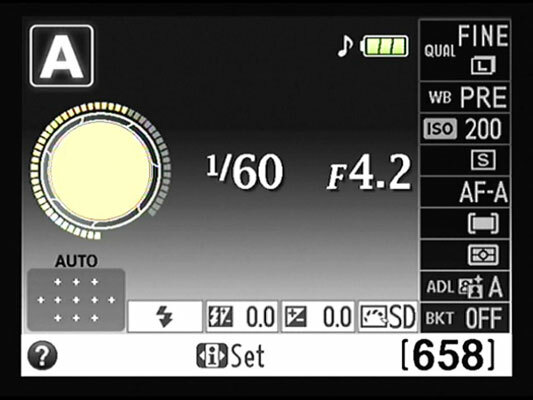 If the camera is successful at recording the white balance data, the letters Gd flash in the viewfinder and the message “Data Acquired” appears in the Shooting Information display. If the camera couldn’t set the custom white balance, you instead see the message No Gd in the viewfinder, and a message in the Shooting Information display urges you to try again. Try adjusting your lighting before doing so. After you complete the process, the camera automatically sets the White Balance option to PRE so you can begin using your preset. You see the letters PRE in the White Balance area of the Shooting Info display. Basing white balance on an existing photo works well only in strictly controlled lighting situations, where the color temperature of your lights is consistent from day to day. Copy the picture that you want to use as the reference photo to your camera memory card, if it isn’t already stored there. You can copy the picture to the card using a card reader and whatever method you usually use to transfer files from one drive to another. Assuming that you’re using the default folder names, copy the file to the 100D5100 folder, inside the main DCIM folder. Open the Shooting menu, highlight White Balance, and press OK. Select PRE Preset Manual and press the Multi Selector right. Highlight Use Photo and press OK.
Options appear. If you haven’t yet used the photo option to store a preset, you see an empty white box in the middle of the screen. If you previously selected a photo to use as a preset reference, the thumbnail for that image appears instead. Select the photo you want to use as your reference image. If the photo you want to use is already displayed on the screen, highlight This Image and press OK. Otherwise, highlight Select Image and then press the Multi Selector right to access screens that let you navigate to the photo you want to use as a basis for white balance. Press OK. Your selected photo appears on the screen. Highlight This Image and press OK to set the preset white balance based on the selected photo. Whenever you want to base white balance on your selected photo, just set the White Balance setting to the PRE option.